Description: IHB 4018 rolls though LaGrange Park at a couple miles per hour. Description: It is about time I see an IHB engine. Description: On the IHB and CSX mainlines at Lincoln Avenue (east of Dolton Junction). Description: A IHB transfer heading for CPs Bensenville Yard comes off the IHB onto the CP with GP40-2 4018 in the lead. Description: Railroad Daze lineup taken from B12 Tower. Description: IHB GP40-2 4018 sits at Bensenville waiting for Franklin Park Railroad Daze the next day as two winged obkects, a goose, and a plane taking off from O Hare pass overhead. 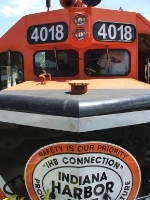 Description: Here is another angle of IHB 4018 sitting at Bensenville Yard.